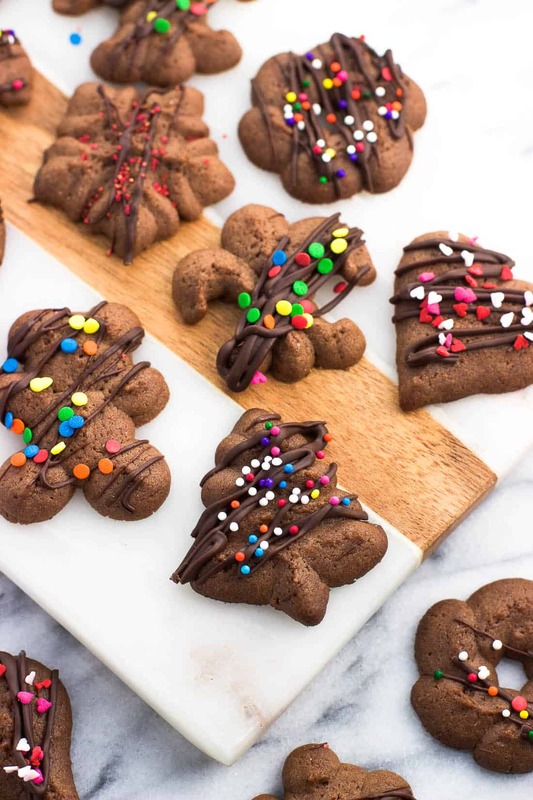 Chocolate spritz cookies are fun and festive! 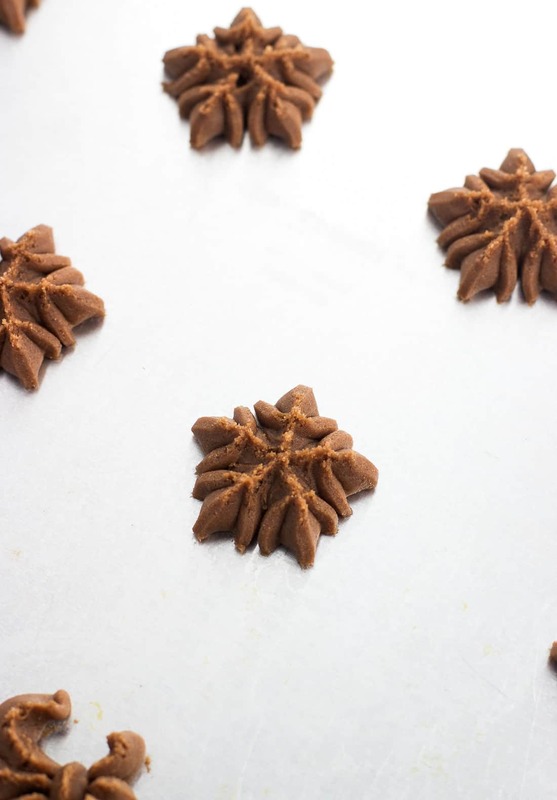 These easily shaped cookies are made in a flash using a cookie press, and can be decorated any way you please. These cookies freeze well! Now that Turkey Day has come and gone, I suppose it’s prime time for sharing a new Christmas cookie recipe with you! 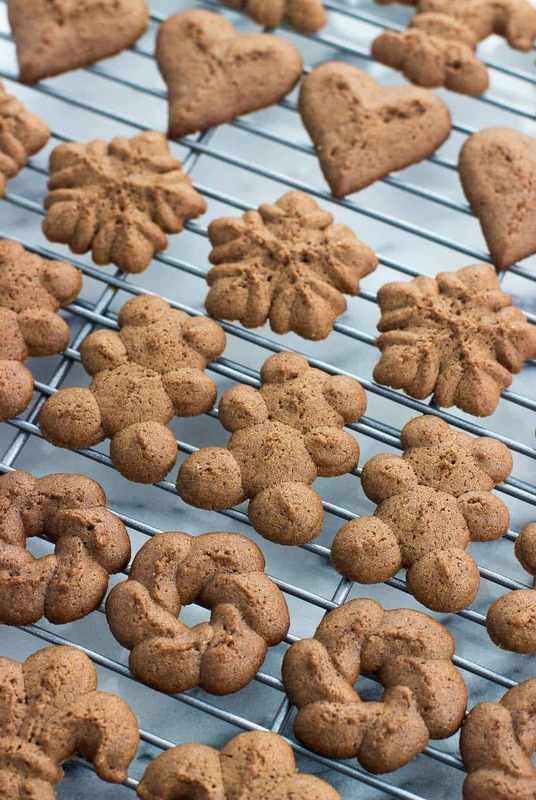 Last year these gingerbread spritz cookies were a big hit, so why not chocolate next? Same fun shapes, in a delicious flavor that pleases year round. Spritz cookies are the perfect option if you love the look of festive holiday cookies but aren’t so skilled in decorating with royal icing. That’s me! More rustic/less polished is my speed. 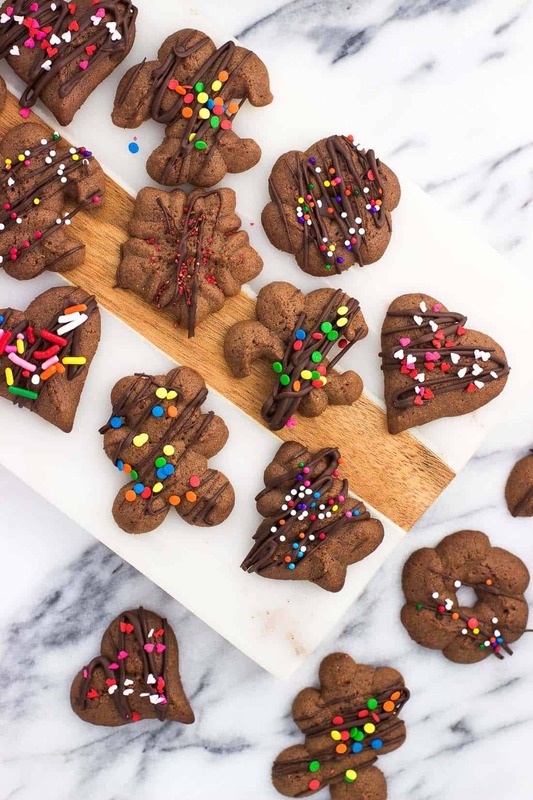 Since these chocolate spritz cookies are made with a cookie press, all the shaping work is done for you. You can change out the discs multiple times to yield as many different shaped cookies as you like. 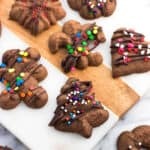 This spritz cookie recipe yields between six and seven dozen cookies, leaving you with plenty of opportunities to make different shapes. I use this cookie press for my spritz cookies. All of the shapes you see here were formed using the standard set of shapes that come with the press. Snowflakes, trees, bears, hearts, wreaths, and fleur-de-lis. 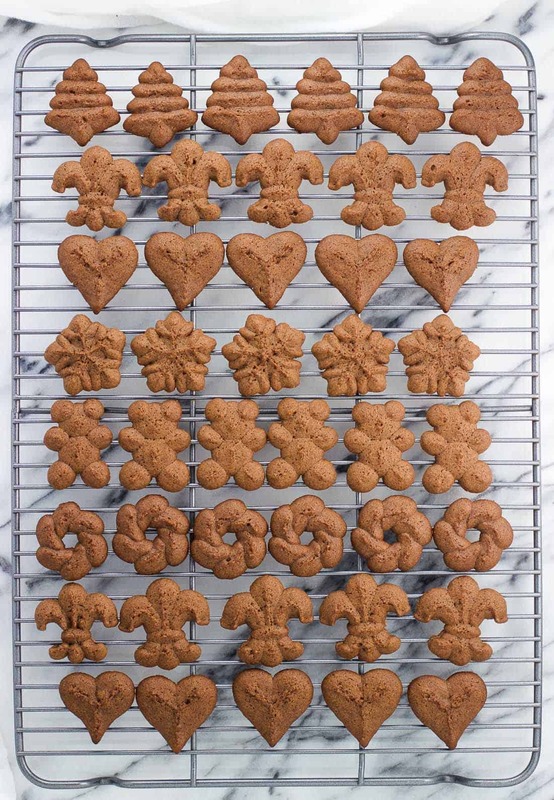 You’ll notice a few extra shapes if you peep back to the gingerbread spritz cookies I shared last year, notably the gingerbread girl and boy. Those came from a Christmas-themed set I found on Amazon, however it appears that they are not being sold at the moment. Other holiday-themed expansion packs are available though if you’re looking for more shapes! When it comes to cookie press discs, you’ll see some made of metal and others made of plastic. I prefer the metal discs (the kind that come with the cookie press), though the very thick and sturdy plastic kind aren’t too bad. Another thing I love about spritz cookies is how efficiently they can be formed. 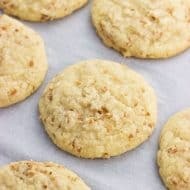 Once you get in a groove of filling the canister with dough and swapping out discs, you can fill up an entire baking sheet of cookies in under a minute. 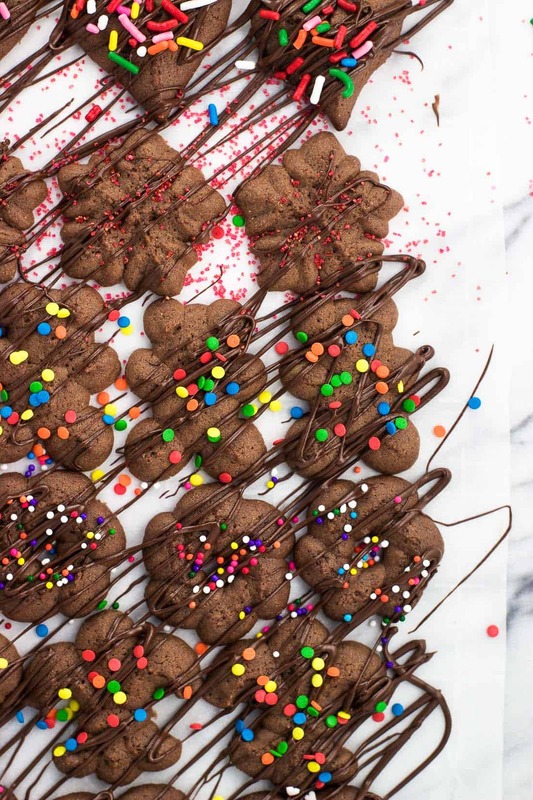 Speaking of, you can choose to decorate these chocolate spritz cookies in a few different ways. For starters, you can lightly press sprinkles into the tops of them before they bake for an easy decorating route. You can also do what I did with my gingerbread spritz and lightly dust the baked and cooled cookies with powdered sugar just prior to serving. <– stupid easy. Here though I did something a little different. Once the cookies were had cooled, I placed them on a sheet of parchment paper and drizzled melted chocolate over top. I then scattered sprinkles onto the chocolate drizzle while it was still wet, then let the cookies sit until the chocolate hardened completely. That way you can include festive sprinkles all the while adding extra chocolate for a treat. Now here’s something we haven’t talked about yet – the taste! Spritz cookies traditionally pack a rich and buttery taste in a small package, and these chocolate spritz cookies are no different. Here though we have the addition of unsweetened cocoa powder to bring the chocolate flavor. 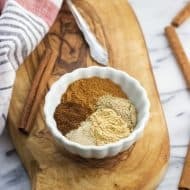 I replaced a portion of the flour typically used with the cocoa powder as to not throw off the ratio of dry and wet ingredients. 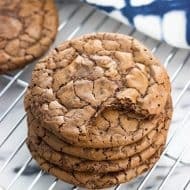 So these chocolate spritz cookies feature the same great tenderness as the originals, all the while with a chocolate spin. An ingredient I add more often than not to chocolate desserts is instant espresso powder. Just a small amount enhances the chocolate flavor in whatever it is that you’re making to make them extra special. Sure can. Once completely cooled, I transfer my spritz cookies to a lidded plastic container, placing a layer of parchment paper in-between layers. The parchment might not be necessary if you’ve picked fairly sturdy shapes, such as the snowflake, heart, or tree. 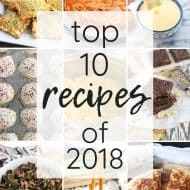 However you’ll want to be gentler with already decorated cookies or shapes like the fleur-de-lis and bears, lest you open your stash and find separated teddy bear ears and feet everywhere. Once frozen, they’ll be good for a month (at least). Just bring them out to room temperature for 20-30 minutes to thaw. Be sure to use ungreased baking sheets for these cookies. There is a fair amount of butter in the dough so you should not have any problem with sticking. 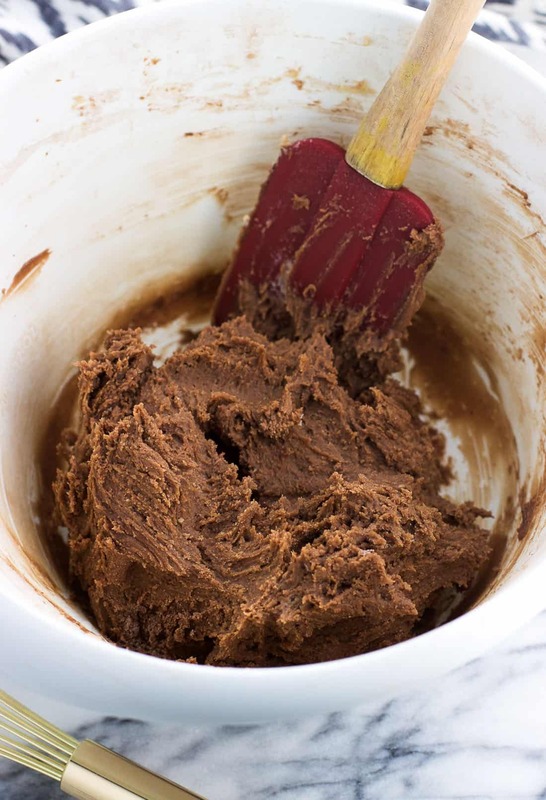 If you’ve ever encountered a problem with the spritz cookie dough sticking inside the cookie press, give the interior of the dough tube a quick shot of cooking spray before you start to help keep the dough moving. If decorating with a chocolate drizzle, I recommend using a knife to separate the hardened drizzle in the spaces between the cookies rather than pulling the cookies apart. Otherwise one of the cookies may hold onto some of the drizzle on the neighboring cookie in an uneven way, kind of like a wishbone. Thoroughly cream together butter, sugar, salt, and instant espresso powder. Add flour and cocoa powder and mix in until combined. Load cookie press with about one-quarter of the dough (amount can vary). Press cookies onto ungreased baking sheet(s) about 1 1/2" apart. Repeat with remaining dough. Decorate with sprinkles at this time if you like and lightly press them into the cookie surface. Bake for 6-8 minutes, or until the cookies are set and the bottoms have browned slightly. Once baked, let cookies cool on the baking sheet for a few minutes, then carefully transfer to a wire rack to cool. For the chocolate drizzle, melt chocolate in 20-second bursts in the microwave, stirring well after each interval until smooth and melted. Drizzle chocolate over cooled cookies. Quickly garnish with sprinkles if using so they stick in the chocolate. Store in an air-tight container. The instant espresso powder can be omitted if you like, though I recommend using it to amplify the chocolate flavor. To drizzle the chocolate over the cookies, I transfer melted chocolate to a plastic bag, snip the very tip of one of the corners, then get to drizzling. Nutritional info is an estimate including the chocolate drizzle. It will differ depending on ingredients and decorations used. 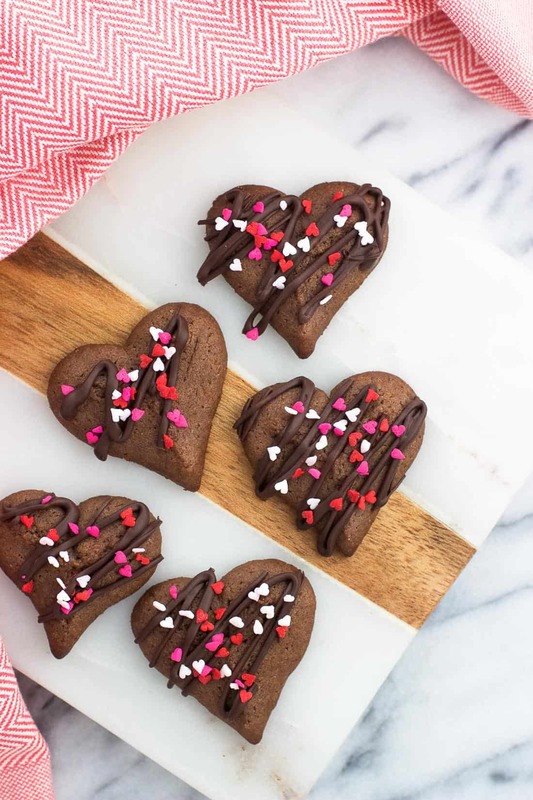 These chocolate spritz cookies also make a great dessert for Valentine’s Day! The heart-shaped disc comes in the standard metal disc set that comes with the press I use.